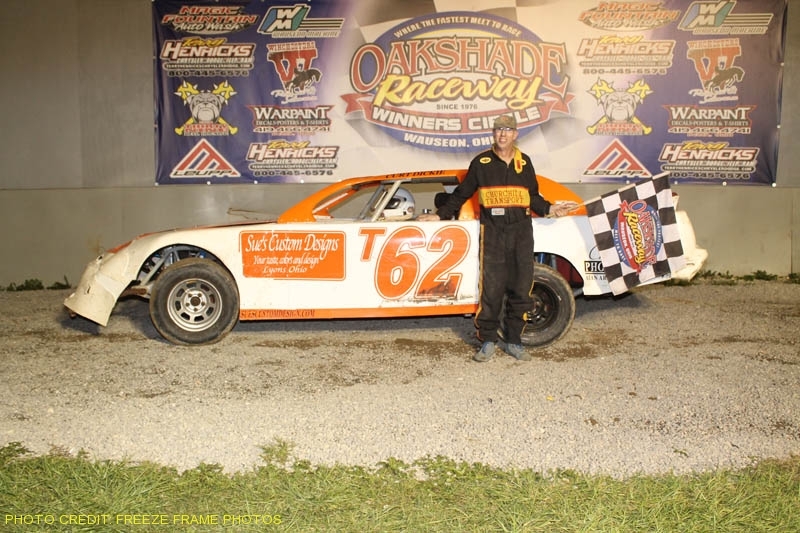 Brian Ruhlman advanced his bid in both the American Late Model Series presented by Sunoco Championship and the Oakshade Late Model Points Championship with his fourth Oakshade feature win of the year. Ruhlman entered the evening third in ALMS points and second in Oakshade points. Casey Noonan led the first lap of the 30-lap ALMS feature, but by lap number two, Ruhlman took command after starting on the outside of the second row. Kris Patterson launched a charge for the lead, but Ruhlman held him off and then began to pull away in lapped traffic. Patterson then started to slide back, losing second to Tony Marks by lap 14. The first yellow flag flew for a spin by Tim Wright in turn two on lap 15. Another caution one lap later slowed things down after Zac Davis, Jon Horner and Tim Stremler all came together in turn two as well. Ruhlman led Marks, Casey Noonan and Patterson back to the green flag. As the rest of the leaders continued to use the inside lane in the corners, Patterson jumped to the outside and once again began moving forward. Patterson got back around Noonan and Marks to regain second by lap 21 of the event. Ruhlman was the class of the field and maintained his lead to win his second ALMS feature win of the year at Oakshade and a check for $2,000. It was also his third ALMS feature win in a row having won the previous night at Eldora and a couple weeks ago at Ionia. Patterson held on to finish second in front of Tony Marks, Casey Noonan and Rusty Schlenk who started 20th. Brian Fisher led most of the sportsman feature, but it was a hard fought win. After the first caution for Bill Huston’s spin in turn one on lap two, Fisher had to fend off Rob Liaeff and last week’s winner, Ray Klawitter for the lead. After a caution on lap 13 for Jeremy Grover and Randy Franks, Tim Fisher, who had worked his way up to third, made the pass on Rob Liaeff to take second. Tim Fisher closed in on Brian Fisher and put on heavy pressure in the final four laps of the event. A couple more late cautions set up a short shootout to the finish in which Brian Fisher held off Tim Fisher to win his first sportsman feature of the year. Tim Fisher held on for a close second followed by Rob Liaeff, Joe Derbeck and Ray Klawitter. It took a few tries to get a complete lap in at the beginning of the bomber A Main. After multiple complete restarts, Jim Scout found himself with the lead in front of Josh Steinacker and Jeff Foks. Jake Rendel was involved in a hard crash when he spun around coming off turn two and Andy Borton made head-on contact on lap six. Jacob Gamber was also collected in the incident. Scout continued his lead and eventually pulled away from Steinacker and Foks to pick up the feature win. Gary Domoe finished fourth with Billy Ruff finishing fifth. Rob Lilly slammed the front stretch wall on the first lap of the bomber B Main, ending his night and bringing out the caution flag. Rob Anderzack and Jody Burton battled for the lead for most of the B Main with Anderzack holding the top spot on the inside groove. Burton using the high groove eventually got by Anderzack with three laps to go to and went on the pick up the victory. Anderzack finished second ahead of Josh Caudill, Ray Jackson and Josh Montague. The bomber C Main started off with a few cautions. The biggest of which was the third that involved Brian Manley, Terry Rump, Steve Dempewolf and Eric Potridge as they all got together coming off turn four. With Satch Crispin leading B.J. Gregory, the caution flag would fly once again after the roof on Paul Grahm’s automobile peeled off and came to rest on the track with three laps to go. Crespen held off Rick Dixon to win his first feature of the year in a close one. Ron Leonard ended up third followed by Brian Manley and Terry Dempewolf. Great racing continues at Oakshade on Saturday, August 14 with B & P Wrecking night feature late models, sportsman and bombers and a special “Crack the Whip” race.